Press statement by AWARE in full. Announcement: All comments are now under moderation before they are allowed to appear on this website. This is due to some comments which are insensitive and inflammatory. TOC will not tolerate comments which are aimed at fanning inter-religious insensitivities. Press statement from the old guards of Aware. We are glad that the truth is finally out. What happened at AWARE AGM on 28 March was a planned takeover by a group of women, guided by their “feminist mentor” Dr Thio Su Mien, who have taken it upon themselves to, as they put it, “bring AWARE back to its original, very noble, objective”. The issue is not whether AWARE has indeed strayed from its original aims. What is really at stake is the space for a diversity of views in our cosmopolitan and pluralistic society. 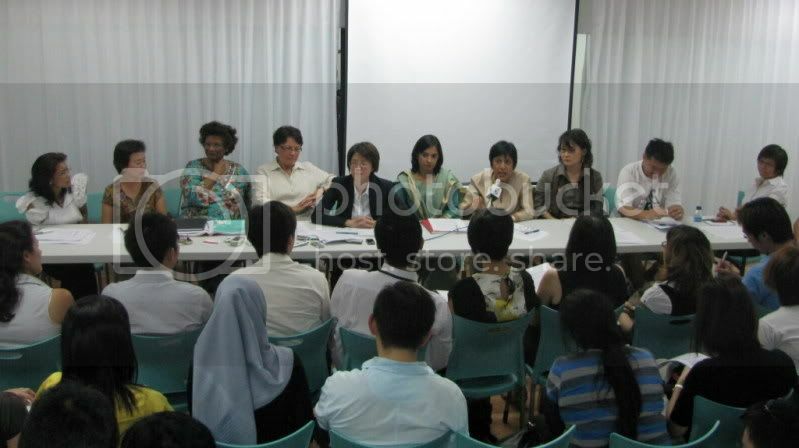 Singapore is a multiracial, mulitreligious and multicultural society. As we progress, the diversity will grow. We have to be able to co-exist, to live with differing views on many issues. What has happened at AWARE is a threat to Singapore’s pluralistic society. A “feminist mentor” takes exception to some of AWARE’s programmes, decides to monitor the organisation’s activities, and then encourages women she knows to challenge AWARE; they could have invited AWARE to a seminar to discuss the programmes; they could have written to the media. Instead, these women joined AWARE in the few months before the AGM and then voted their representatives onto the Executive Committee – without giving any indication that they were acting together. They continued with this stance until Thursday when they finally told the truth. The cannot be the way forward for Singapore. We cannot have people acting like moral vigilantes running around and taking over established organisations. If Dr Thio and her mentees feel that AWARE has strayed from its original aims, or that some of the programmes are unsuitable, then go ahead and criticize AWARE, but do so openly. Better still, form their own organization to offer parallel programmes with what they see as the right messages, and let the public choose which they prefer. Their motives and actions will then be visible to all. There will be transparency and accountability.